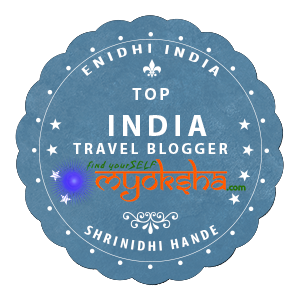 This survey lists me among other well known travel bloggers in India. Got a mention in travelfriendz.com's compilation of "Top travel bloggers and what makes them tick"
While the above sounds like lots of recognition, I wish to remind you of popular travel blogger Nisha Jha’s opinion here: She feels that some of these recognition from hitherto unknown/lesser websites/agencies are an attempt to gain publicity for themselves by tagging popular people. (You recognize someone as top blogger, that person goes all around drumming the recognition, in turn giving free limelight and publicity to the website/agency that announced the top blogger list). This could be true, I am not denying it. However above recognition/mentions have come unsolicited and without any commitment on my part to promote/return the favor or do anything that I don’t want to do. I would have loved to begin with recognition directly from Nat Geo and BBC, but the probability of that happening is near zero, so I am accepting few appreciations that came my way. I leave it to my readers to decide how seriously they want to take these recognition or how worthy I am for these appreciations or how credible are the organizations that issued the list. 1. Wrote a guest post on Suryagarh’s blog about our trip. (They hosted us for a short visit to Jaisalmer and showed us around. Some of my other Jaisalmer posts can be read here, here and here. 3 Ten early morning drive destinations from Bengaluru - This post has been immensely popular with over a 1000 likes so far. Do not miss out on it. 3. Guest post on AutosArena on Freelander experience. 4. Haven’t written anything recently, but do check my Gumakkar profile for some of my guest posts there. 1. Do check my youtube channel- have created playlists and have added few videos recently. 2. Was browsing through alexa and stumbled upon below: It says most of my readers are females (twice the internet average! ), graduates and access enidhi.net from work. 3. Looking forward to my first Kolkatta visit next month. My first time in WB. Any ideas/tips welcome. No major travel plan in near future. A wanderer journaling her travel stories all while journeying and eating her way through the world with her one and only. Aditi is a Dubai based Indian travel blogger whose work and life hasn’t stopped her from aiming to check the entire world off her bucket list. ok. Best wishes to you.